What will you do if you find metal flakes in a drink they have just served you? You will complain. What will be your reaction if they are gold flakes? “Er…ehm…bearer, Can you give me an old pepsi bottle? I will drink it from my home. No, no, no…I will pack it. Please don’t bother, he he…”. My friend, cool down. This is no lottery. This gold in the drink hasn’t come by any mistake. You have in your table a peg of Goldwasser. It has specks of 22 carat gold in it. Yeah, pure gold indeed. For that we have to go a long way. Back through the time. Crossing continents. Sifting through conflicting stories. We are now in Poland, at Danzig which is the German name for Gdansk. We see in the first story, a pleased Neptune, the God of Ocean. 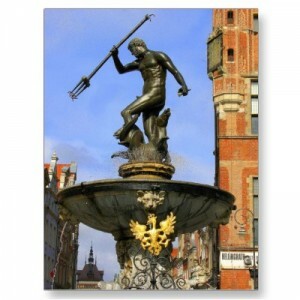 He was happy about the people of Gdansk who used to throw gold coins into his fountain. They should be rewarded, he thought. Why not make the whole water of the fountain into vodka? He smiled at his ingenuity. But soon his plan backfired as he saw selfish landlords carting off barrels and barrels of the exotic water. As he was about to take back his gift he saw one man, the owner of Pod Lososieum restaurant (where you now get the liqueur, and it is their story:-)) standing away from all this melee. Neptune was pleased with him and turned his stock of vodka into Goldwasser. Now listen to the next story. We see an angry Neptune. He was all pissed off by the people of Gdansk throwing coins into his fountain. One morning when he could take it no more, Neptune struck the water with his trident and smashed the coins into tiny flakes of gold. (I know where malayalees have suddenly gone now. There is no point in bringing a towel. You don’t get anything in straining the liquid. The liqueur is rightly priced for all the gold in it). Let us blow away myths and search the annals of history to find traces of the precious metal in drinks. In the 13th century the great Catalan physician Arnaldo de Villanova found his name on the hit list of people to be executed during the Inquisition. But one day he got the Pope as his patient. This could be his chance. Villanova saved his neck by administering the Pope an elixir, containing gold. It worked! Could be psychological, cynics dismiss. Since the quest for gold by alchemists of medieval times was inextricably connected with the quest for finding an elixir for life, people considered gold vital to good health. Later in the 16th Century, the Dutch-born alchemist Ambroce Vermollen sought refuge in Danzig when the Inquisition tried to get to him. He was granted asylum. A grateful Vermollen, pleased like God Neptune in the myth, now wanted to gift the town with something exotic. He started a distillery in the town to produce Goldwasser with a medley of roots, herbs, and spices including cardamom, coriander, cinnamon, lavender, cloves, juniper and thyme. And threw gold into the potion. It became an instant hit. Danzig continued to be home for the drink, until the world war. When the land went to Poland, the distillery was shifted to Germany. 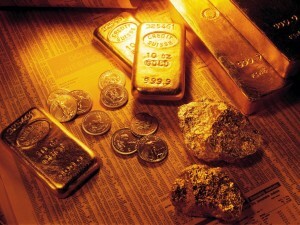 Gold, we know is tasteless. So the syrupy liquid on the palate imparts no flavor except for a hint of the herbs. But who looks for the taste when the fun is in holding the glass against the light and gently swirling it? You will see gold dust rising up like snowflakes. Goldwasser in a little cut-crystal liqueur glass is a peek into heaven. The drink became incredibly popular after Louis XVI fell in love with it. Peter the Great of Russia also stumbled upon this gem when he visited Danzig. He made sure that he would get a steady supply of Goldwasser to his palace, before he left. They thought Goldwasser, with specks of gold in it, was the ultimate royal drink. There are a couple of urban myths about the drink. Some believe that Goldwasser indeed has magical healing effects especially on those with joint problems. And some other people suspect that the gold in it makes microscopic injuries down the mouth and gets absorbed to the blood on the way. So that we get drunk even before the liqueur touches the stomach. 🙂 sir gold ullil poville ? atho…. Dear Mr.Manu my man,, my man.. you are the man.. you are.. Ah.. so nice.. so very very nice.. I’m thinking, should I go and look for it now coz I still have a quarter of that Chopin left in my shelf. I may do the gold digging sooner rather than later, I need to see if I can find it here. And if I bring home the Goldwasser today I may face some hated looks and yelling, so to play fair I must wait for a couple of weeks before I bring it home :D. Its history is very tempting and the tailpiece to top it all “piss away gold! !” way to go 🙂 Kalikalam allandethu parayan alle muthasheee! !